Prime Minister Malcolm Turnbull appears on 730. 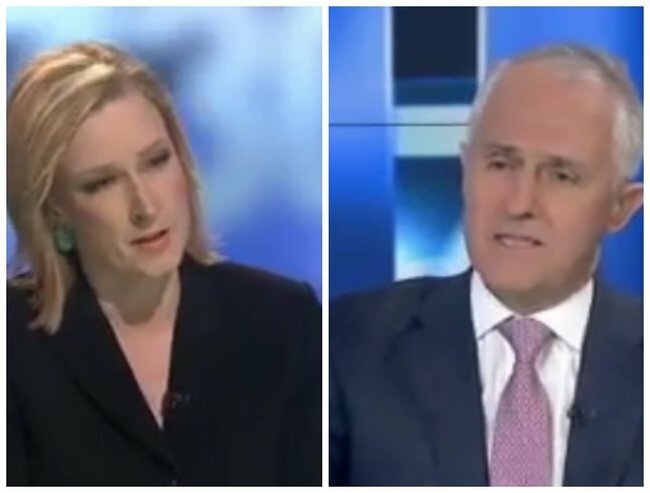 Leigh Sales to Prime Minister Turnbull: “I ask the questions on this program". Malcolm Turnbull tonight appeared on the ABC’s 7.30 program for the third time as the Prime Minister and it was clear he was there to talk about one thing — innovation. Earlier today, the Federal Government announced it would spend almost $1.1 billion in the next four years to promote business-based research, development and innovation. PM Turnbull unveiled his much-anticipated Innovation Statement in Canberra saying he wanted to drive a so-called “ideas boom”. In good news, $13 million has been allocated to increase the number of young girls entering maths and science in Australia. “The number of girls studying maths in the later years is declining,” the PM told Leigh Sales. Today’s announcement aims to improve that statistic by increasing awareness of opportunities for young girls in maths and science. “There has never been a more exciting time to be an Australian,” he said. However, after eight prime time minutes of questions about the $1 billion innovation announcement made today, the NBN, and what cuts to the company tax rate would mean for the Budget — acclaimed journalist and host Leigh Sales attempted to ask the Prime Minister about the other major political story dominating the news recently — Mal Brough. But when she tried to question the PM about whether Special Minister of State Mal Brough had misled the parliament over whether he had asked James Ashby to copy documents from former Speaker Peter Slipper’s office on his behalf, he began to get rather shirty. “Aunty ABC loses interest in innovation,” the PM said. “Has he (Mal Brough) offered to step down from the front bench?” she said. After several more questions and serious stone-walling on the matter from the PM where he made it clear he did not want to discuss it, he finally said. “There are lots of issues, we can walk and chew gum at the same time,” she said. “Well the problem is we can’t, you see, we can’t chew gum at the same time,” said the Prime Minister. “Well we can actually,” she said firmly. “If every guest came on the program and they only got to talk about what they wanted to talk about, it would be a very different program,” Leigh patiently explained. “Let me ask you this question, how interested do you think your audience are (in Mal Brough)?” the PM said. “I ask the questions on this program,” she gently reminded him. And with that she moved on… to questions about another topic not preferred by the PM — the defection of Ian Macfarlane to the National Party last week. As someone who has gone many times to the 7.30 studios with a Prime Minister awaiting to be interviewed and had the terrifying job of preparing them for the questions Leigh Sales or Kerry O’Brien would ask… I can honestly say it is no mean feat. Hours of forensic research and work goes into the preparation for a 7.30 interview. And the reason? You do not get to pick the questions. You do not get to set the agenda. You do not get to choose what you want to talk about. Ever. That is up to the interviewer. If they choose to ask you about something that you want to talk about — that is simply a bonus. However, if they choose to use the entire time talking about children in detention, or the topic you want to AVOID more than bumping into your ex, that is their prerogative.